We’re about 10 or so miles NW of Jenkins KY, in the coalfield. Bevinsville is not listed in my book of Kentucky placenames. Darn. 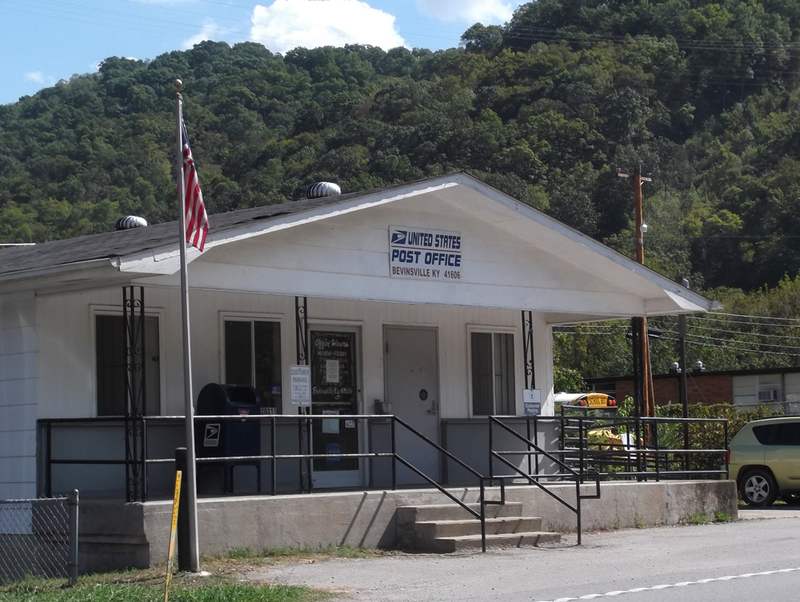 This was the only post office picture that I retained on this day. After we left the Inland Steel coal mine in Wheelwright, my camera stopped writing to the SD card. 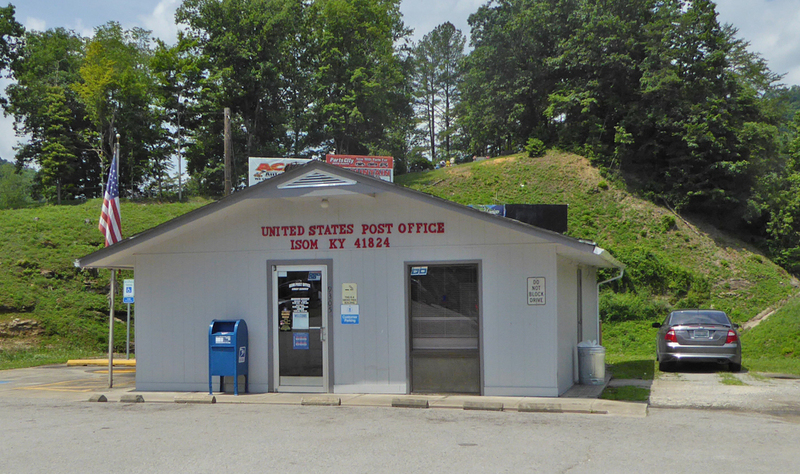 I lost pix of maybe two other post offices and a couple of other shots. That’s a sinking feeling when you discover that you’ve traveled over 200 miles (round trip) and find that some pix are missing. Grumble. This is the long-abandoned coal mine above Wheelwright KY. If you look closely, you can see the date the entrance was constructed: April, 1930. The mine was closed around 1951, when the seam was depleted. Story is that this mine produced a superior product. I’m standing there to give you a sense of scale. There’s a picture of this mine in operation here. This was in 2009 in Unicoi County, near Steep Ridge. I haven’t been back lately. 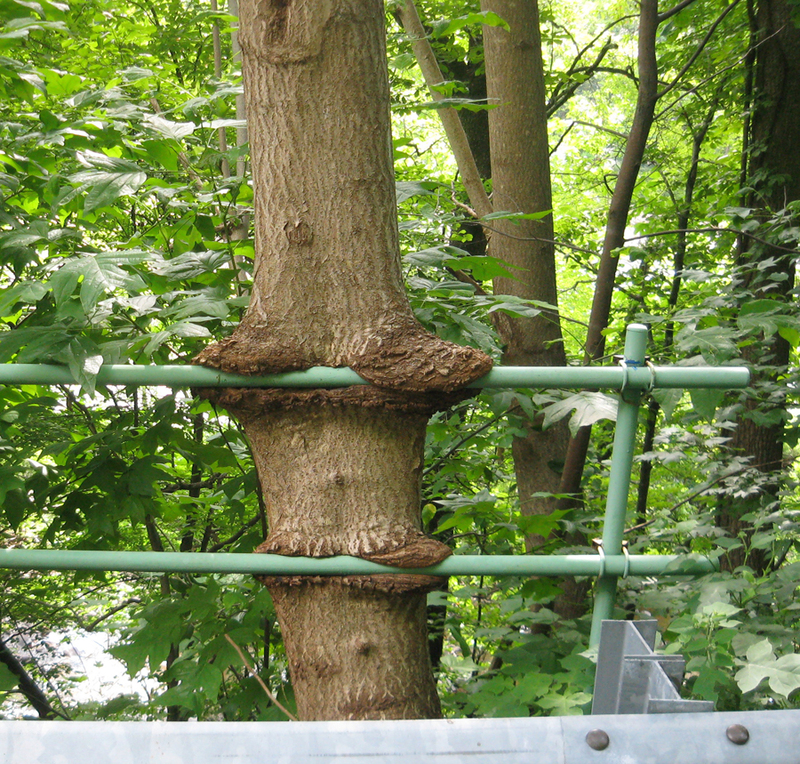 By now, either the tree has eaten the support rods or, more probably, someone has come along and offed the tree. As we readied to head up the ridge, a man warned us of rattlesnakes. Up on the ridge, another man showed up pictures of some rattlesnakes he’d seen. Most snakes would rather not make your acquaintance, thank you very much, but some, like the aggressive timber rattler, should not be challenged. Leave. Leave now. We didn’t see any snakes that day. 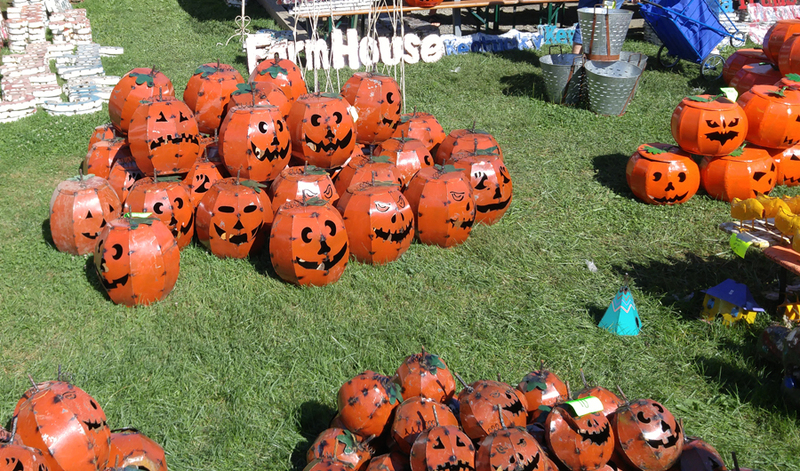 They were ready for Halloween at the annual Hillsville Flea Market and Gun Show. This was taken Saturday, September 3. The Flea Market was, as usual, packed. The organizers claim to have an attendance, over a 4-day period, of 500,000. I believe it. My walking app on my phone showed me getting 10,128 steps (4.58 miles) when I got back to the car…and we’d faded on going to another part of the event. Very pleasant weather until around noon, when it began to heat up. And, yet, in the middle of all these people, on the main street, which because of all the pedestrians, was barely two vehicles wide, in came a Trump-Pence full-size bus, stopping every half block to sell yard signs and stuff (they may have been giving them away…either way, some lady nearly speared me with one of those yard signs. I regret that I spoke rudely to her). Then the police moved them along.